SPAR, the largest hypermarket store chain in Nigeria has been named best supermarket in Nigeria. SPAR Nigeria was nominated from a list of other supermarkets operating in the country based on the supermarket’s hypermarket’s quality standards and relentless service in offering Nigerians the best products at the best prices. The African Quality Achievement Awards (AQAA) is an Annual event initiated at celebrating leadership innovation and creativity in quality management in Africa. 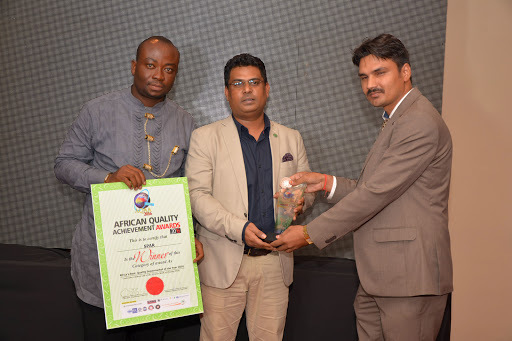 The Award ceremony which took place on Thursday, September 9th at the Sheraton Hotel and Tower Ikeja, Lagos is an initiative of the African Quality Institute in collaboration with IBMN Integrated Services, The Certified Institute of Quality Management and the Pan African Quality Organization. Dignitaries representing various industries and businesses nationwide were present at the event. SPAR as a hypermarket store, takes cognizance of the various kinds of shopping missions and adapts its products and services in respect of Choice, Quality, Service and Value to translate the entire shopping experience into a World Class One. SPAR understands the soul of the Nigerian consumers. Over 5 million customers walk into its outlets annually, choosing products and services supplied by over 1,000 small, medium and large entrepreneurs and manufacturers from across Nigeria. Today, SPAR employs over 2,000 people from every section of the society. Speaking on the occasion, SPAR spokesperson John Goldsmith, thanked the organizer for acknowledging the efforts of SPAR team in consistently delivering quality in terms of product offerings, choice of products, customer service and retail store infrastructure across its 10 stores in Lagos, Abuja, Port Harcourt and Calabar. He added that to deliver consistent quality across all its stores, SPAR team is continuously monitoring the quality deliverables. Being a hypermarket SPAR offers a very wide range of products starting from Grocery & Household, Bakery & Butchery, Fruits & Vegetables, Hot Meals, Wine & Spirits, Fast Moving Consumer Goods, Consumer Electronics, Large and Small Home Appliances, Mobile Phones, Laptops & Tablets, Perfumes, Watches & Jewellery and Furniture. Quality deliverables for each product categories are very different from each other which necessitates setting quality standards for each product category and a continuous measurement against the benchmarks. When it comes to quality service delivery, SPAR replies on its retailing training programs for all their staffs across levels and locations. SPAR in Nigeria is a part of worldwide chain with a global presence across 42 countries which gives it access to World Class Training programs and Best Practices. SPAR takes human capital development very seriously. In the recently launched SPAR store in Calabar, GMD, Mr Haresh Keswani engaged directly with the new team in training and grooming the new recruits to equip them with the required skill sets to deliver world class shopping experience. It’s very important to stay connected with the shoppers, get feedback on continuous basis to make sure their expectations are being met. The shoppers evolves continuously and so the quality standards and processes has to be improvised and periodically revamped to deliver the shopper expectations. SPAR has opened multiple channels to capture the voice of their shoppers through dedicated Hotline Numbers, Emails and Social Media Platforms. John Goldsmith added that with the proliferation of Facebook and Twitter, growing number of shoppers prefers to reach us through them. Attending to customers is no more confined to Store Operating Hours, it has become 24 x 7 job and SPAR has put a dedicated team to address this. Customer Feedback both compliments and complaints are taken very serious and are routed to all the concern function for immediate resolution and to make the future training programs more robust. Working towards this end, SPAR remains unswerving in ushering positive socio-economic changes in its host communities. This approach remains embedded in the hypermarket’s ethos even as they rapidly expand their footprints deeper into Nigeria. The Artee Group is working on an aggressive roll out plan of SPAR stores across Nigeria. Apart from strengthening the presence in the existing cities of Lagos, Abuja, Port Harcourt and Calabar, SPAR stores will penetrate new geographies like Enugu, Asaba, Kaduna, Ilorin to name a few. SPAR in Nigeria is a part of an international retail chain originating from Holland. Franchised to Artee Industries Limited in 2010 for Nigerian operations, SPAR Hypermarket stores has retail space of over 33,000 m2 spread across 10 stores, serving over 5 million shoppers annually SPAR stores are located in Lagos, Abuja, Port Harcourt and Calabar. SPAR, a Dutch multinational retail chain has global presence in 42 countries across 4 continents with over 12,000 stores. Apart from Nigeria, SPAR boast of its presence in Angola, Australia, Austria, Belgium, Botswana, China, Croatia, Czech Republic, Denmark, France, Germany, Georgia, Greece, Hungary, Ireland, Italy, Japan, Lebanon, Mauritius, Mozambique. Namibia, Netherlands, Norway, Oman, Poland, Portugal, Qatar, Russia, Slovenia, South Africa, Spain, Switzerland, Ukraine, United Arab Emirates, United kingdom, Zambia, Zimbabwe to name a few.